THE design brief is simple. Put racers around the world on the top step of the podium. Kawasaki has taken this approach with the KX for over 40 years and in case you haven’t noticed, it’s had a hell of a lot of success. Faster and Lighter. Upon first glance the new KX looks ‘all new’ from the ground up, with revised styling and some very extensive changes to the chassis and engine. While that is mostly true, some parts also remain very much the same, and in some cases exactly the same, as in years gone by. The engine retains the same design and layout as previously, but the intake system, valves, and camshafts have undergone some serious changes. A completely redesigned airbox and air filter allow increased airflow through two larger vent ports at the rear of the seat. This improves throttle response and believe it or not, reduces intake noise keeping the engine that little bit quieter. Adjusted intake cam timing and a new cylinder intake port design contribute to increased power and efficiency throughout the rev range. The piston crown is revised to suit the new valves, along with an slightly new exhaust system to ensure maximum power. It is also interesting to note that the airbox, intake and piston changes, as well as weight savings from the gearbox and cases all combine to remove a total of 2kg from the overall engine mass of the new KX450F. The chassis changes are quite complex and refined, and another 1.4 kg has been removed by very carefully removing material from various parts around the frame. The head tube and swingarm mounting areas are made using different processes, to improve rider feel and increase traction, and the centre section of the chassis is now 6mm narrower. Showa SFF air suspension first found its way onto the KX450F on the previous 2015 model, the works-replica fork is still very new and offers the latest in air suspension technology from Showa. The internal valving has been tweaked from last year to suit the updated chassis, and in the rear we see a new linkage and lighter shock spring to suit frame modifications. The introduction of the Kawasaki KX Calibration tool will allow new KX owners to plug in the new hand held device to access fuel and ignition mapping settings. The tool comes with pre-set maps and settings to allow the user to fully customise the engine characteristics of their new 450. Further info and pricing is a bit scarce at the moment as it was not yet released at the time of writing but is due in dealerships before the new year comes along. Unlike its ‘all new’ big brother, the small bore KX250F received a minimalist approach for 2016. In other words, there’s bugger all difference compared to last year. New graphics and a green rear fender will be the only changes noticeable to the naked eye, while on the inside Kawasaki has made a few changes to the front and rear suspension settings. The Showa SFF (Single Function Fork) Type 2 fork has been a welcomed addition to the KX250F over the past few seasons, offering a wide range of adjustability and simplified tuning to the mechanic or rider. The Uni-track rear suspension and linkage system again offer plenty of adjustability and 2016 updates are aimed at increasing high speed stability. The motor on the KX250F is known for its horsepower, and the 2016 version is no different. 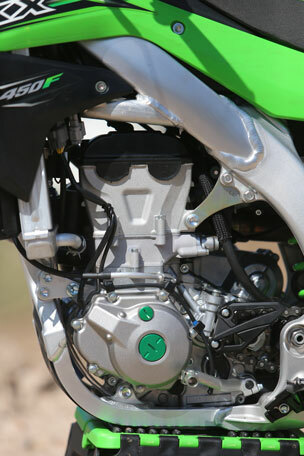 Kawasaki’s dual fuel injection system creates an intake unlike any other 250cc four stroke in the class. The two injectors work simultaneously together and are placed in very different positions. A down stream injector, close to the throttle body and engine, provides the smooth and instant throttle response, it does most of the work at low to mid RPMs. The upstream injector, closer to the airbox and behind the throttle body, takes over and becomes the primary injector as the RPMs climb. As the upstream injector is located further away from the engine, Kawasaki claim this helps to improve the mixture of fuel and air, as well as provide a cooler mixture. This adds up to improved fuel and engine efficiency and increased overall power. Included as standard equipment on the KX250F are the power couplers, which simply clip on to the wiring harness of the KX to change the power character to suit specific types of terrain – soft, medium or hard. Like the 450 the power couplers are able to be reprogrammed using the KX Calibration tool to suit the specific needs of the rider or track. Feeling comfortable is the key, and Kawasaki seem to be taking all the necessary steps to make sure is the new KXs are easy to get used to and make you feel at home as soon as possible. The chassis changes on the 450 really slim-line the feel of the bike, and it now has a much flatter, narrower feel. On the track it is very noticeable and you get the feeling you can be much more precise with the way you ride the new bike. The engine has certainly calmed down from years gone by and is less aggressive off the bottom and into the mid-range. Some extra over-rev feels like it has come into play on the new model with the big bore KX having a very respectable top end. 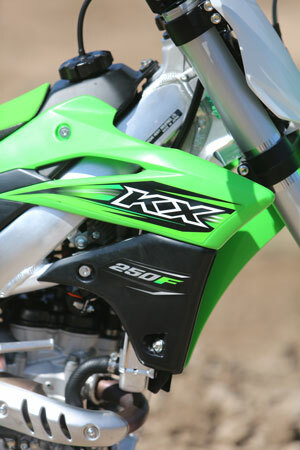 In an overall sense, the new KX engine is a bit easier to handle but it hasn’t lost that trademark power it known for. It’s still fast and lively with more than enough punch for punters like us. The SFF air suspension can be a bit fiddly, and even daunting if you don’t know what your doing. Thanks to technology and smart phones, Showa has made all this a bit easier and released an App for all the tuners out there to perfect the art of tuning these forks. On the day of our test we were lucky enough to have Kawasaki technicians on hand to sort out our personal preferences, where we dropped two psi in the inner chamber, much like dropping a spring rate. This was very noticeable on the track and going a bit softer from the standard settings was a move in the right direction for our 80kg test pilot. 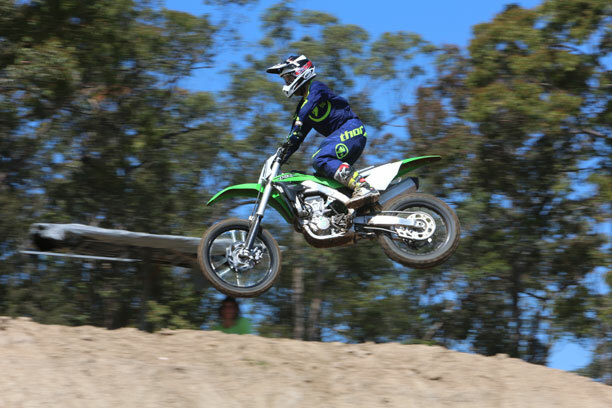 The KX250F is a very lively and fun bike to ride. Immediately, the fast revving engine will take your fancy and guide you quickly onto the race track. It’s fast and strong off the bottom and holds well through the mid range. If you can hold it on hard, the KX will rev to the moon and make great top end power. The suspension and chassis work well and offer a comfortable set-up for the larger 250F rider. Lightweight riders will enjoy the bike, but might go looking for a set-up not as stiff. Both bikes are equipped with Renthal handlebars, and the recent addition of the 270mm front disc sure makes pulling up these bikes a whole lot easier. On paper the 2016 Kawasakis are quite advanced machines. Almost everywhere you look on the 2016 KXs you will find something that has trickled down from the factory bikes, oversized front brakes, Holeshot Launch Control, Power Couplers, Titanium Nitrate coated forks, Showa SFF air forks on the 450, Dual EFI on the 250, black DID rims, Renthal handlebars, and the list goes on. With the 250 priced at $9,999 and the 450 at $11,199 that’s some serious value for money. As for their on track performance, the 250 is very much the same as last year’s model. It’s a fast bike with enough power to challenge any bike in the class, its handling is good but will likely require a more personalised set-up, especially if you’re smaller in stature. The 450 is a great improvement over the previous model and offers a much more rider friendly package than in the past. It’s shed some weight, become more predictable and not so aggressive to ride. The 450 class is all about rideability, and Kawasaki has done an incredible job going down that path with its new 450. It’s hard to give a direct comparison without a back to back test, but the new KX450F is certainly a contender for best 450 motocrosser on the market.